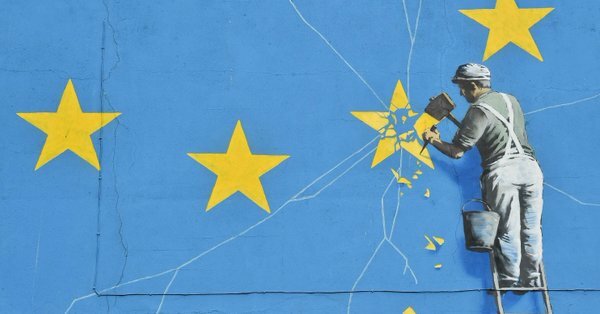 Overview: The UK Prime Minister has two weeks to strike a new deal with the EC over the Irish backstop or return to Parliament in mid-February to consider alternatives, six weeks before Brexit. Sterling has recovered about half of yesterday's drop. The Australian dollar jump back to $0.7200 was aided by the nearly 10% jump in iron ore price after Vale announced a sharp reduction in output. The Mexican peso is the weakest of emerging market currencies after Fitch cut Pemex's credit rating two notches to BBB- and maintained a negative outlook. Equities are narrowly mixed. Although Chinese and Japanese stocks fell, most of the other regional markets rose. The Dow Jones Stoxx 600 in Europe is eking out a small gain through the morning, led by consumer discretionary and materials sector. Bond markets are also mixed. Italian bonds may be building a concession ahead of today's supply. The ADP private sector jobs estimate, the FOMC meeting, and Mexico's Q4 GDP are the highlights from the North America session. Australia reported slightly softer Q4 CPI of 1.8%, down from 1.9% in Q3. It rose 0.5% on the quarter. Evidence softer inflation reading will not sway the investors or policymakers is evident by the more than three basis point increase in Australia's two-year yield. The more important news for investors was the 9.5% rise in iron ore prices to 15-month highs, as Vale announced that decommissioning of trailing dams will cut its output by 40 mln tons. Australia's equities rose 0.2%, but the material sector was up over 2%. Japan reported retail sales rose 0.9% in December, which was more than twice the gain expected after a 1.1% decline in November (initially 1.0% decline). The year-over-year rate ticked down to 1.3% from 1.4%. Economists expected a 1.0% pace. While stronger retail sales are helpful, the economic rebound from the contraction in Q3 still seems lackluster. Tomorrow Japan is expected to report a 0.5% decline in December industrial output. It follows a 1.0% slide in November after October's 2.4% surge as the reconstruction from the natural disasters kicked-in. At least 20 Chinese companies warned of weaker earnings today, blaming the economic slowdown and accounting changes. Nevertheless, Bloomberg data suggests foreign investors may have bought a record amount of Chinese shares this month through the Shanghai and Shenzhen connect facility. It appears foreign investors bought CNY52 bln (~$7.8 bln) of A-shares. The Chinese yuan rose about 0.25% against the US dollar. The greenback was sold for the sixth consecutive session and has not fallen below the 200-day moving average (~CNY6.7250) for the first time since last June. Officials had seemed to imply they did not want it to go beyond CNY6.70, but the market seems intent on testing officials. The trade talks get underway today and tomorrow in Washington. The most that can be reasonably expected is for both sides to accept that progress is being made and that there is time for another round of talks before the early March deadline. Next week's Lunar New Year holiday is draining liquidity, and this is evident in the money market (and forwards in Hong Kong). The Australian dollar is testing the $0.7200 area. The high for the month was set near $0.7235. We are more inclined to sell into these gains than look for an upside break. The dollar is in less than a quarter yen range against the Japanese currency. There is a nearly $400 mln option at JPY109.30 that expires today. There are much larger options struck at JPY110 that expire tomorrow and Friday ($1.3 bln and $1.8 bln respectively). When everything was said and done, the UK House of Commons authorized the Prime Minister to seek alternatives to the current backstop provisions in the Withdrawal Agreement. The EC and several countries individually, and notably Ireland has summarily rejected this. If a customs border cannot be between the Republic of Ireland and Northern Ireland, nor a border between Northern Ireland and the rest of Britain there is one obvious solution: Remain in the same customs union. Parliament rejected this course yesterday. Sterling's six-week rally reflects perceptions of diminished downside risks, but the House of Commons vote that rejected a no-deal exit barely scraped by (318-310), and it is not binding (like the referendum itself?). Positive action still must be taken to avoid a hard Brexit. May was given a two-week mandate. Without changing the UK's red lines, it seems highly doubtful that the EC will change its red lines. UK officials must recognize this and appear to be playing for time. Sterling was sold yesterday when it seemed that the risk of a no deal exit had increased. Ideas that a delay in Brexit is all but inevitable may be helping sterling stabilize today. France reported its Q4 GDP rose 0.3%, which is the same as in Q3 but better than expected. Ironically, exports seemed the key, and they contributed 0.2 percentage points to growth. Household demand was weak. Consumer spending slumped 1.5% in the month of December, and it was the third decline in four months. Growth last year slowed to 1.5% from 2.3% in 2017. Several countries, including Germany, Italy, and Spain report Q4 GDP tomorrow, and the preliminary aggregate figure for EMU will also be reported. Political risks may be rising in Italy. Prime Minister Conte warned the government is “wobbling.” League leader Salvini’s strong anti-immigration stance is leaving him vulnerable to some legal challenges, according to the local press. Meanwhile, the League support is seen near 32%, roughly double last year’s electoral performance. Tensions between the unlikely coalition partners have reportedly increased, and the ambitious Salvini may be tempted to push for an election ahead of the May EU Parliament elections on ideas that he could head a center-right government with Berlusconi’s Forza Italia and the Brothers of Italy. The euro is confined to a quarter of a cent below $1.1450. The market appears to be waiting for the FOMC to provide more incentives. There are no expiring options to note today, but tomorrow there are options struck at $1.1400-$1.1405 for 2.2 bln euros. We anticipate the North American session to probe the upside today. Sterling recouped about half of yesterday's decline and appeared to have lost some momentum in the European morning as it approached $1.3120. The euro is consolidating yesterday's gains against sterling. It reached GBP0.8755 yesterday and has eased back to GBP0.8715 today. Chart support is seen near GBP0.8700. There are three main events on the US diary today: the resumption of trade talks, the ADP private sector jobs estimate and the FOMC meeting. The first day of trade talks should not generate many headlines. The ADP jobs estimate is expected to fall from 271k to 181k, largely matching the decline expected to be reported by the national report at the end of the week. There the consensus is for payback after a 312k job increase in December. There is no doubt the FOMC is on hold through the first part of the year. While the market anticipates that the Fed is likely on hold all year, many economists still look for a hike or two. The FOMC statement should be succinct. While it maintains the roughly balanced risk outlook, the forward guidance will likely be replaced with the emphasis on patience, flexibility and data dependence. Although the impact of the balance sheet reduction is controversial, we look for some rhetoric that will ease the anxiety in some quarters. Powell is likely to emphasize what the Fed has already indicated, that the balance sheet will remain much larger than before the Great Financial Crisis. He is unlikely to announce a target in time or size. Note that although the Fed says it can reduce the balance sheet by $50 bln a month since last October, it is letting only about $40 bln a month roll-off. Mexico reports Q4 GDP today. It is expected to slow from 2.4% to 2.0%. The downgrade of Pemex has hit the peso. It warns about the quality of it as a standalone credit and notes that it has under-invested in upstream businesses. The company has a total negative equity balance since 2009, and there have been 14 consecutive years of declining output. Pemex dollar bonds (due 2027) had the biggest sell-off yesterday in three weeks. The US dollar is trapped in a CAD1.3200-CAD1.3285 trading range. It tested the top side yesterday and is set to push to the downside. The dollar rose to almost MXN19.15 in Asia after dipping below MXN18.97 yesterday. It has not closed above the 20-day moving average (~MXN19.1370) since December 5. Elsewhere, note that Chile is expected to hike rates 25 bp tomorrow (to 3%) and the currency has gained for the past four weeks, leaving the greenback at the lower end of its five-month trading range.